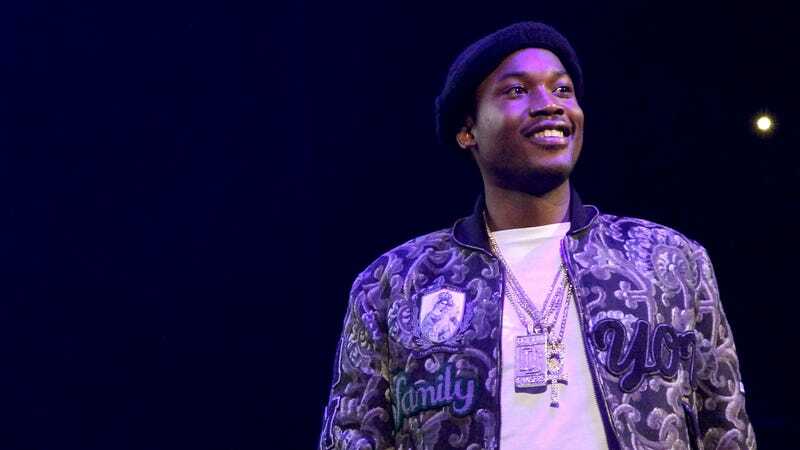 Could an Eagles Super Bowl Victory Draw Attention to Meek Mill's Unjust Sentencing? Unless you live under a rock, you probably watched the Super Bowl Sunday night—or at the very least, you heard that the Philadelphia Eagles won the game for the first time ever (GO BIRDS), after squaring off against the New England Patriots. I know nothing about sports, but leading up to the game, I learned that Eagles fans have a reputation for being the kind of insane that leads you to climb light poles even when the city of Philadelphia has greased them with Crisco to save you from yourself. But Philadelphians aren’t asking to be saved—they want to climb things and jump off them, parade down Broad Street and order from the hot food bar at Wawa in peace, and for the love of god, they want to free Meek Mill. The Philadelphia rapper, you may be aware, is currently in prison on a parole violation. His case is one of those that gets worse and worse as time goes on. But like all other things born from the City of Brotherly love, the people of Philadelphia unabashedly stand by and love Meek Mill—and so do a ton of other people, because post-Super Bowl, there has been a spike in people looking him up on Google and listening to his song “Dreams and Nightmares,” which the Philadelphia Eagles used as their Super Bowl intro track. According to Google Trends, there was an increase in searches in the U.S. for “Meek Mill,” which started to climb around 10:30 p.m. EST Sunday night, right around the time the Super Bowl ended. It spiked about an hour later around 11:30 p.m. EST. “Dreams and Nightmares,” the opening track on Mill’s debut album, is now charting on iTunes. The track is now at No. 5 on the Top Songs chart for Hip-hop/Rap in the iTunes store, which means there’s been an increase in people buying the song, too. If there’s an increase in people buying and listening to one of his most iconic songs, perhaps there will be an uptick in people reading about Meek Mill’s legal plight and another buoying of support for the troubled rapper. His legal team has been asking for the recusal of Judge Genece Brinkley, but there hasn’t been an update on that front yet—at least not one that has been made public. We can only hope that things look up from here for the Philly rapper. At the very least, I hope he gets a fat check from all of these song downloads.